Javelin deliver an extremely chill mix of genres in their detail-packed debut. 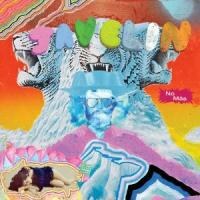 Javelin could have easily slipped past the independent music radar this year. Their pitch was nothing groundbreaking, but fortunately their delivery was. After their demo, Jamz n Jemz, received some pretty decent feedback last year, cousins George Langford and Tom Van Buskirk readied their first full-length for debut through Luaka Bop Records. No Más, Spanish for “No More”, stands out largely because of its production value; the Rhode Island duo created 15 simple, happy songs, each more carefully crafted than the last. Overall, their sound is painstakingly retro -- garment-wise, it’s a perfectly conserved, pastel-colored, vintage '80s t-shirt. “Vibrationz” is probably their most well-known song to date, and a perfect example of the '80s-inspired, beat-happy sound they were shooting for since their demo release. Alhough “Vibrationz” is nothing but pleasant, it turns out to be a rather temperate starter. “Mossy Woodland” is somewhat more unexpected, and it sounds unbelievably good. From the could-be-discordant arrangements to the meditated structure, you start noticing the huge amounts of work that went into perfecting the record, It’s one of Javelin’s winning cracks at being more engaging. On the other hand, if you can’t get behind the chipmunks-inspired vocals on “Oh! Centra”, you’ll find it’s a self-indulging crime. The only upside is that Javelin never, ever again misses the target by so much. For the most part, Javelin catches your attention, but doesn’t actively demand it. Unfortunately, in spite of some heavy hooks, No Más lacks the energy and/or the heavy beats necessary to be considered a good collection of party tunes, but that’s beside the point. The tracks can either flow pleasantly in the background or be subjected to conscientious listening. In case of the latter, the listener will take pleasure in a skilled mix of the electronic and instrumental; the duo is definitely not all samples and loops. Vocals are rare, though (almost) always spot on -- I’m looking at you “Oh! Centra”. “The Merkin Jerk”, “Intervales Theme”, and “On It on It” are all standouts, though it’s hard to encounter a track that is truly not worth the listen. Somewhere past the middle, you’ll notice that a very low key, laid back -- not to say chill-out -- feel characterizes the entire album. It sometimes runs the risk of sounding a little too “vanilla”, but it’s constantly saved by its creativity. It’s mellow, maybe a little too mellow, but the duo seems to be okay with that. And although the layout of the tracks flows in and out of consciousness and doesn’t really take the record anywhere specific, it is considerably cohesive. No Más definitely does not grab the listener by the horns, which is really it’s biggest drawback, since it might mean some people look right over Javelin’s remarkable work. Thankfully, they’ve been pretty well received so far: great spots at SXSW, interventions in the Modern Museum of Art in NYC, and a busy tour schedule can attest to that fact. If No Más is just Javelin finding their footing, there is no telling what's next.